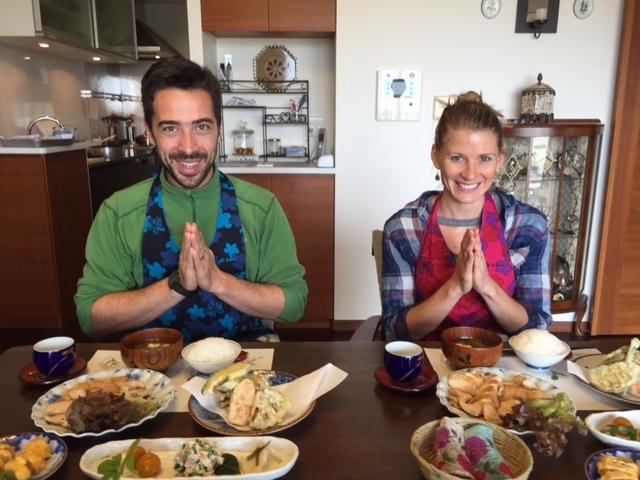 Thank you very much for giving us your reviews on Japanese Mother’s Cooking Class in Fukuoka! The host was very nice, friendly, helpful, enthusiastic. We learned to make a lot of interesting dishes. The class was perfect! The host was fantastic, helpful, friendly. We made lots of dishes very quickly, but it felt like no work at all. I would absolutely recommend the course to everyone! Excellent and very enjoyable. My teacher was so lovely. Now I can cook more Japanese style at home. Your registration process was also quite and efficient. I truly like the style and content, had attended many cooking class’ globally, but being at a local house is a truly unique experience. Thank you! It was great. I really enjoyed cooking, eating and tea ceremony. It was a great class and wonderful experience! Very nice moment that we shared with our instructor. We will never forget. You have to put advertising of your cooking class in all hotels. It was really a great and unforgettable experience! Thank you very much! No suggestions. Everything was perfect for me. This class is very good for everyone who wants to see the Japanese food how its made and what is behind the cuisine. Very good experience! My instructor was wonderful and I had a great time learning and enjoying our conversation over the meal. The organizer helped us in a very very good way. Our class host is very nice and friendly. Very friendly, very helpful, and very nice. I must recommend it to other people. I think that this class is well organized and very friendly person!! Very charming lady, took us to the shop and well for instruction, and gave a very good in Japanese cooking. I have had a terrific time! Delicious, a wonderful experience with the instructor. I would have liked more time in the grocery shop with a lesson or Japanese ingredients and spices. But is was so nice my instructor let us make special requests for food! Our instructor was fantastic. Loved the class, she was helpful, kind, and patient. She was a wonderful more and is a great cook. No complains, our instructor was lovely and patient, only wish we could take home some of our food as I could not finish everything – but I tried! This cooking class was terrific. I would not suggest changing anythings. Very good! More understanding on Japanese family food cooking! Well done and prepared! It was fully eventful. I am really proud of it. I learnt a lot too! Thank you! It was so nice. It should remain as it is. Perfect! Nothing else to add, our instructor has very complete class contents plus great teaching skills and hospitable and kind. It was excellent and very nice to visit a Japanese home. My instructor is a wonderful host. The instructor was kind and patient as she taught us to cook traditional Japanese food. I had a great time during this experience. This has been really enjoyable and well run. I appreciate the recipe and certificate – it was really pleasant. I am extremely grateful for the opportunity to take this class. Wonderful! Cheerful helpful instructor, she was wonderful. The instructor was very welcoming and organized. Could not be better! Really enjoyed super market, especially learning different vegetables, fishes also learning about mirin, sake, soy sauce. The host was wonderful, patient and helpful. Our instructor is very kind and I really enjoy Fukuoka style food. Thank you! I have nothing to add. The host was so sweat and helpful and very patient. She left me with a good feeling about the people and the culture in Japan. Really great, especially enjoyed learning of food traditions and also the grocery store tour was useful! It was great! The host was fantastic and the food was great. She made us feel so welcome and was a great teacher of cooking. Great class. All the food was delicious! 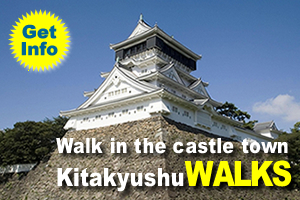 It was a great class and I’ll recommend this to other tourists visiting Fukuoka. It was great! Keep up with the good work and lovely instructions. 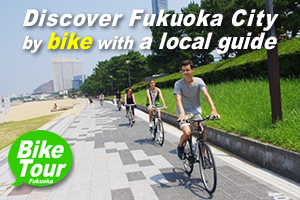 We will definitely return to Fukuoka one day! I was just perfect warm feelings. Good food!!! Healthy to me!!! I loved the class! Food was great and instructor was very kind. I will definetly come back to visit homestay! It was very warm and friendly and I would definitely come to visit again. Thank you for this lovely time, can’t wait to visit again! Excellent class, great instructor, friendly personel. It was great! Nothing to change! It was wonderful and our instructor was a very generaous, kind and resourceful instructor. It was great just the way it was. She is so warm and inviting and kind. Very hospitable. I would come again. The class was very informative and a lot of fun. 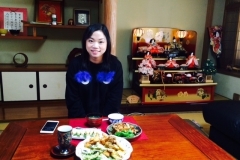 It was a home to learn how to cook traditional Japanese dishes. Very kind and knowledgeable host, welcoming. I would recommend to othoers. Thank you. Our instructor is a wonderful and friendly. All the dishes we cooked were delicious! Especially the plum wine! Thank you! Very easy to follow ever for beginners. I really love the class! Very informative, instructor was very kind. We are very happy to meet you! Hope to see you again in Poland or Japan. 10 points maximum. Thank you our instructor! Rearlly nice class, good explanation of all the ingredients. Shoppng was fun too. Thank you very much and had very good experience! See you next time! Really good experience and great that we could book even though we were too late. This class was very good. It was very nice to learn about Japanese cooking and also to get a glimpse what a Japanese home. Very lovely. Our instructor was very friendly and helpful. Willing to answer our questions. We enjoyed going to the market the best. Really enjoyed the class, thought the dishes were very nice and would like to try making them again. I would recommend the class to others. Very nice to go to the supermarket and learn about the local Japanese food. Kind teacher, who speaks English very well and lovely food. It was really nice and the food was delicious! Great vegetarian menu! Also the shopping together was a nice way to start. The instructor is the best, very kind, very friendly and a very good teacher. I was able to cook Tamago yaki! Excellent! The food was delicious and great opportunity to go to market and cook the food. The cooking class was excellent and very delicious. It was a very Japanese meal. I loved it! Instructor was great! This was my first class and she was very helpful. I very much enjoyed the class and learned too! It was great! Wish I could do this every week! I had such a great time, learnt so much from the class! I’ve always wanted to fry cooking dashi-maki tamago! Thank you for teaching us so much! Our host is really lovely and it was very nice to have the tea lesson together and having desserts. It’s very special to be in a house. We also got to chat with her husband. An excellent course already! Do not change anything! It was a great experience and our teacher was perfect! 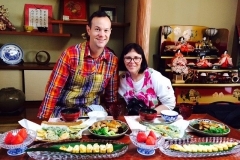 We loved to learn how to cook traditional Japanese dishes! Easy to prepare and delicious. Our teacher was wonderful, very warm, friendly and welcoming, we had a fantastic time and the food was delicious! Very good instruction and the food was delicious. I’d definitely recommend this to family and friends. Very informative, delicious food, friendly teacher. It was a lot of fun! The teacher was adorable and so much food! Very satisfied. It was a lovely and inviting experience, very fun and informative, will definitely recommend to friends. Everything was perfect. I have no suggestions to improve. Many thanks for the hospitality. It is our first time to be at the Japanese house, enjoy a lot! 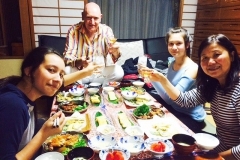 We received an amazingly authentic Japanese experience in a family home. We were very impressed by their expertise and were satisfied with the food. I enjoyed the shopping and all the extra information (Tea ceremony). The teacher put lots of effort and I even feel kind of sorry for making her works so much. Counting that the fee is really reasonable. It was really interesting and I am also happy with the taste of the result. 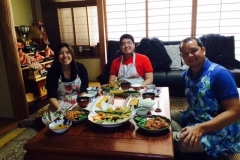 Thank you very much for giving us your reviews on Fukuoka Home Cooking Class!